2019 Business & Community Expo - What's Cookin'? Name: 2019 Business & Community Expo - What's Cookin'? 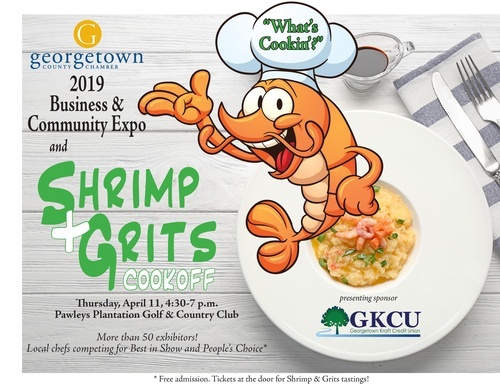 Join us for the 2019 Business and Community Expo and the first annual Shrimp and Grits Cook Off! Over 50 exhibitors will be involved with the Business Expo, while many chefs from this area's outstanding restaurants will compete for the Best In Show! Table reservations are currently available at $150. Admission will be free, but tickets will be on sale to taste the variety of Shrimp and Grits recipes. Sponsorships are available by contacting Sharon Abee at sabee@visitgeorge.com or calling 843-546-8436. Sharon Abee or Julie Dyer at 843-546-8436. Tables are now available for $150. You can reserve one on-line at www.visitgeorge.com or by calling 843-546-8436. Admission to the Business Expo is free. Tickets will be sold at the door for tastings of the Shrimp & Grits competitors creations.